American history will show that there have beenBritish invasions to our country during the Revolutionary War and during the 1960’s with the Beatles, Rolling Stones, and the rest of the British musicians who followed. Fans of Drum Corps Associates and drum corps fans alike know of the Kidsgrove Scouts joining the ranks of DCA in 2010 when they first came to America. They followed up by returning in 2012 and on Monday August 24th, they will once again return to compete in the ranks of DCA. The unit was founded in 1910 as a marching band as part of the Kidsgrove Scout group which they remain attached to and remain as such to this day. They are six time British Champions, (2007, 2009, 2010, 2011, 2012, and 2014) and European Champions in 2010. Kidsgrove were also the British Winter guard Champions in 2014. The corps competes in the UK circuit which is very similar to our DCA circuit. They have regional shows throughout the year then a championships with prelims/finals at the end of September. There are five units in the makeup of the Scouts comprising of the Senior Corps, Junior Corps, Senior Winter guard, Class A Winter guard, and a Cadet Winter guard. The corps is very large this season with fifty seven brass, twenty eight percussion, thirty four color guard, two drum majors, and some extras to handle the props. Their 2015 show is titled “The Stone Circle” – The Magic and Myths of Stonehenge. The music is from “Medea’s Dance of Vengeance” by Samuel Barber. Musical selections include “Raising the Stones”, “Summer Solstice”, “Pagan Celebration”, “Druid Chant”, and “The Sacrifice”. The corps is hiring the equipment from the Boston Crusaders to use during their stay and former DCA Public Relations head, Tom Peashey, will be helping them along the way as he did on their last visits to the U.S. 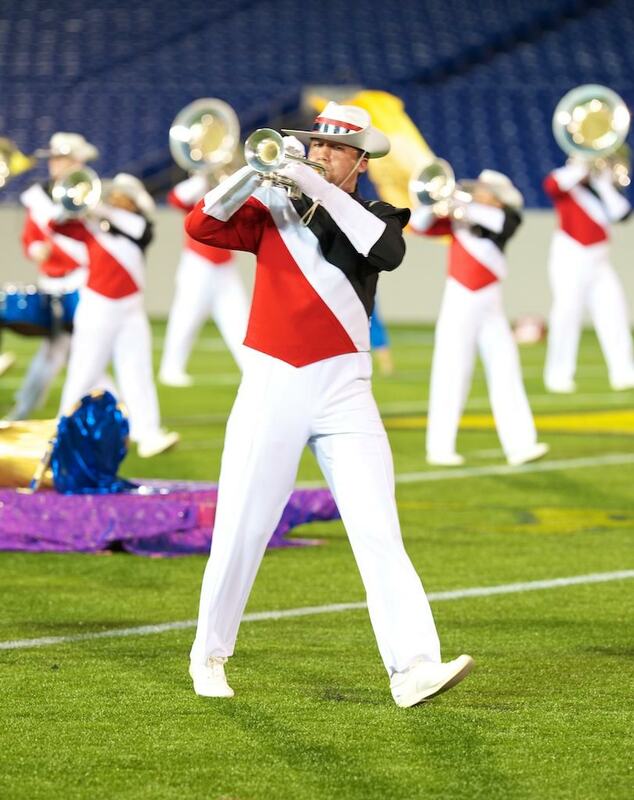 The Kidsgrove Scouts will have a tour party of an estimated 210 people, which is made up of 120 members, 20 staff, and the rest being supporters and family members. In addition to this they have many more supporters traveling to Rochester themselves to watch them at championships. The members, supporters, staff, and every person on the trip pays for the tour in order to keep it at a very reasonable price. They do fund raising as a group and some do it individually to pay for their tour fees. Unfortunately, there are no corporate sponsors to help them with donations. In 2015, an estimated 50% of corps members made the trip over in 2010, and 65% of them came here in 2012. The corps will have a week in New York when they arrive, mainly rehearsing, then traveling to Bridgeport, Ct. to compete in the Hurricanes show on August, 29. They then travel to Seneca Falls for a couple of days off before more rehearsals. Then it is off to Rochester for championships. In 2010, the Kidsgrove Scouts placed sixth at DCA finals and seventh in 2012. The goal this time is for a higher placing at championships, but as Corps Director, Rob Swindells stated, “our main focus is the audience, as we want to put them on their feet multiple times during our show”. That drum corps fans is what it is all about! When asked about what the corps enjoyed most about on their visits in 2010 and 2012, Rob stated “visiting different places, meeting new people, making new friends, but the MOST important thing they loved were the fans as the connection they made with the audiences was fantastic! They look forward this year again to reuniting with old friends, making new ones, and performing to the fans of DCA. Ladies and gentlemen, please welcome from Staffordshire, in the United Kingdom, the Kidsgrove Scouts.